V12- Isaac planted crops in that land and the same year reaped a hundredfold, because the LORD blessed him. V13- The man became rich, and his wealth continued to grow until he became very wealthy. V14- He had so many flocks and herds and servants that the Philistines envied him. V15- So all the wells that his father’s servants had dug in the time of his father Abraham, the Philistines stopped up, filling them with earth. V17- So Isaac moved away from there and encamped in the Valley of Gerar, where he settled. V18- Isaac reopened the wells that had been dug in the time of his father Abraham, which the Philistines had stopped up after Abraham died, and he gave them the same names his father had given them. V19- Isaac’s servants dug in the valley and discovered a well of fresh water there. V20- But the herders of Gerar quarreled with those of Isaac and said, “The water is ours!” So he named the well Esek, because they disputed with him. V21- Then they dug another well, but they quarreled over that one also; so he named it Sitnah. V22- He moved on from there and dug another well, and no one quarreled over it. He named it Rehoboth, saying, “Now the LORD has given us room and we will flourish in the land. V23- From there he went up to Beersheba. V24- That night the LORD appeared to him and said, “I am the God of your father Abraham. Do not be afraid, for I am with you; I will bless you and will increase the number of your descendants for the sake of my servant Abraham. V25- Isaac built an altar there and called on the name of the LORD. There he pitched his tent and there his servants dug a well. V26- Meanwhile, Abimelek had come to him from Gerar, with Ahuzzath his personal adviser and Phicol the commander of his forces. V29- that you will do us no harm, just as we did not harm you but always treated you well and sent you away peacefully. And now you are blessed by the LORD. V30- Isaac then made a feast for them, and they ate and drank. V31- Early the next morning the men swore an oath to each other. Then Isaac sent them on their way, and they went away peacefully. V33- He called it Shibah, and to this day the name of the town has been Beersheba. Opposition and criticisms always come against us whenever we attempt anything worthwhile. There will always be those who oppose us. There will always be those who fight us. But that doesn’t need to stop us from doing what we know God has called us to do. Our key text tells us that Isaac had been blessed by God. His prosperity got the attention of his neighbors, namely the Philistines, and turned them into enemies. Now, the normal yield in a good year was 25-50 fold. Isaac reaped 100-fold, that is, one hundred times what he planted. Here, we see Isaac, a man of faith facing opposition from his enemies. What did he do? How did he respond? Isaac didn’t fight with his enemies but he kept digging another well and that is my title this morning – KEEP DIGGING ANOTHER WELL! Abraham and Isaac had been sojourning in a land that one day their descendants would inherit. But they sojourned as strangers in a strange land. The occupants of that land could easily consider them enemies. As they sojourned through the land, they dug wells for themselves. Digging a well was considered tantamount to a CLAIM OF OWNERSHIP of the land on which it was located. It enabled a man to dwell there and to sustain herds. Rather than recognize this claim, the Philistines sought to wipe it out by filling up the wells dug by Abraham with mud. Their desire to overthrow all claims on their land was so intense that they would rather fill in a well, an asset of great value in such an arid land, than to allow this claim to remain unchallenged. ENVY AND JEALOUSY were the root causes for the opposition. For no apparent reason, the Philistines began to act strangely toward Isaac. Once they had been open and friendly, but now, all of a sudden, their attitudes changed. They became jealous and felt threatened by the blessing of God upon Isaac’s life. So, what did the Philistines do? First, they stopped up all the wells of blessings that God had given to Isaac by filling them with earth. Second, they broke the relationship with Isaac. They chased Isaac out of their land. Application: Many relationship problems stem from jealousy. When you are blessed, you seem to be growing while others are diminishing. The Philistines decided to just “sling mud” into Isaac well and cut off ties with him. So, the first well of Isaac was JEALOUSY. Question: Are you like Isaac today where your well has been filled up by people who are jealous of your blessings and success? Or are you like the Philistine herdsmen who are WELL-STOPPERS? You can’t stand feeling more diminished than your friend and so you filled up the well of other’s blessings with mud. You even cut ties with that person. Let me say this to the leaders of the church – the minute you are serious in taking ownership of your calling or ministry or even vision, you will face opposition and many people will become WELL-STOPPERS. They will throw mud into your well of calling so that you cannot fulfill what God has called you. The root causes of opposition and criticism are ENVY AND JEALOUSY. In the midst of opposition, we are given two options – fight or flight. Isaac chose the latter – He moved away from there. And he settled there. Did Isaac allow the opposition by the Philistines to stop him from digging well, from taking ownership of his inheritance left by his father Abraham? Even after Isaac was expelled and he was settling in the Valley (symbolizing the low times of his life journey), he continued his calling. His calling was to establish his presence in the land, claiming his father’s wells by RIGHT OF INHERITANCE. Isaac REOPENED ALL THE OLD WELLS that had been dug in time of his Father Abraham and he gave them the same name his father had given them. Application: There are many blessings and inheritance that God has blessed us in the past but jealous people and enemies of God have shut them down and quenched the blessings. Isaac “reopened the wells” left by his father. Those old blessings that are left by our predecessors – we should reopen them like revival, old Pentecostal teachings, holiness and old promises. Do not destroy the ancient landmarks. Reopen them. They are our inheritance. The servants of Isaac dug again in the valley and discovered a second well of fresh water but again the herders of Gerar quarreled with the people of Isaac. Jealousy can be subtle, gently removing you from the scene (withdrawal). However, as in this section of Genesis 26, jealousy can turn into opposition and even into OPEN ARGUMENTS. “ESEK” the word used in the original text, can even mean a LAWSUIT. Envy brings strife, and strife brings contention. A person you never quarreled with before will suddenly begin to act like your enemy, openly challenging you for no apparent reason. This is the third level of relationship problems. At this point, the problem has gone from jealousy to opposition to accusation. The person involved in the test has now begun to actually spread things against your character and is slandering you to others for no reason. This level is now fueled by DEMONIC POWER to destroy you. The instigator of this accusation has its source from the ACCUSER OF THE BRETHREN -SATAN. At last, a breakthrough came! Because Isaac “acted” and didn’t “react”, the enemy had to leave him alone. HE OUTLASTED ALL HIS CRITICS, OPPONENTS AND ACCUSERS. The fourth well was uncontested. Isaac named it REHOBOTH which means “wide open spaces” or “room enough”. No longer was everything he did controversial and contested. The Philistines finally gave in and let Isaac have his SPACE. Now it was prosperous and abundant. Application: Isaac kept digging another well whenever there was opposition. He didn’t fight back. He just moved on and dug another well until the enemy gave up opposing him. And that is what we need to do when opposition comes. We don’t have to fight back or get frustrated. Just pick up the shovel and dig another well. Even when resources are scarce, even when the critics oppose, even when the enemy tries to shut you down, by faith just keep on going. “Johann Sebastian Bach, who after several jobs and moves finally settled down in Leipzig in 1723. There, he became the music director and choirmaster at Saint Thomas’s church and school but he faced a lot of opposition. The town council was fighting against him all the time and no one appreciated his musical genius. They said he was a stuffy old man who clung stubbornly to obsolete forms of music. As a result, they paid him a miserable salary and even tried to take away the meager inheritance he left for his wife after he died. Even so, those years in Leipzig were Bach’s best years musically. Despite the opposition, he kept writing cantatas, nearly one each week. Contemporary composers do well to write one cantata a year, either for Christmas or Easter and most write just a few in their entire lifetimes. But Bach was writing one cantata a week and 202 of them are still being performed today. Most of them conclude with a chorale based on a simple Lutheran hymn and all of them are closely bound to biblical texts. Even so, after Bach’s death, some of his music was sold and some was reportedly used to wrap garbage. For the next 80 years, his music was neglected by the public. It’s as if people seemed glad to wipe their ears of his music. When Isaac faced opposition, he dug another well. When Bach faced opposition, he wrote another cantata. When people of faith are opposed, they keep on going, knowing that God will make a way for them. Application: How about you? Are you feeling the sting of criticism and rejection? Are there those who want to trip you up? Is the enemy trying to stop your forward progress in the Lord? Please, don’t give up on the Lord. By faith, just dig another well. By faith, just keep going on until GOD MAKES ROOM FOR YOU! When opposition comes, by faith, just persevere. Recall what God has said and rely on His commitment to us. For you see, God’s commitment to us is more important than our commitment to Him. We often waver in our own commitments but God never does in His commitments to us. God will keep His promises to us no matter what, and we can count on His resolve even when our own resolve has shriveled up to almost nothing under the heat of the struggle. That was what Isaac did. In the heat of opposition and drought, he counted on God’s promises. He relied on God’s commitment to him. V5- because Abraham obeyed my voice and kept my charge, my commandments, my statutes and my laws. God had promised to guide Isaac to the place where he should dwell. Little did Isaac realize just how God was to lead him back to the place of His promise and presence. To a large degree, it was by means of adversity and opposition. Isaac’s enemies helped him discover the area where he would spend his sojourn. As one traces the journey of Isaac on a map each time he left a well he had dug, you discover that each move he made brought him CLOSER TO THE HEART OF THE PROMISED LAND WHERE GOD WANTED HIM TO BE. E.g. 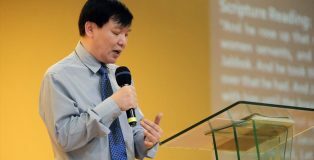 The opposition and contention we experienced form 2004 till 2012 was actually the divine plan to bring us closer to the heart of God’s promise – the Tabuc Suba land where God wanted Etab to be. Without that contention and fall-out, we would still be stuck in the rented Quezon building today. But God in His sovereign will and wisdom used the adversity and opposition to fulfill His promise that we would cross over to our own church land. So, Isaac worshipped the Lord, pitched his tent and dug another well. This time, the well he dug is a WELL OF PROMISE. Up until now, he had been digging wells of opposition with names like “contention” and “enmity”. Now he dug a well that would remind him of God’s promises and every time he drank from that well or passed it by, Isaac would remember what God had said. Isaac would remember God’s commitment to him and that would help him in his commitment to God. Application: My friends, when opposition comes, we need to do what Isaac did. We need to worship the Lord, pitch the tent for a little while and dig a WELL OF PROMISE. In other words, we just need to stop and remember God’s commitment to us so we don’t give up on our commitment to Him. “In the beginning of the year of 1856, David Livingstone, the first missionary to the interior of Africa, found himself surrounded by hostile, angry Africans. In his 16 years in that continent, he had never faced such hostility. He was in danger of losing his life and he contemplated running away. Then something happened that changed his mind and gave him peace. He recorded the incident in his diary on January 14, 1856. In his worst moment, Livingston remembered the word of Christ and he remembered that it was the word of a Gentleman, who never goes back on His word. That’s what kept him going. That’s what gave him peace and helped him persevere, and that’s what will keep us going, as well. Enjoy the presence and peace of God in your life, so much so that others will notice it too. That’s what happened to Isaac. The Philistines had self-deception. They claimed they always treated Isaac well. Did they? They only stopped the wells, chased him off their land and gave him trouble ever since he entered their territory. Was that considered as “treating Isaac well?” They were deceiving themselves just like many times our enemies thought they were right and weren’t that bad and cruel to us and had been treating us very well. Despite all the harassment, the Philistines could clearly see that God had blessed Isaac, that God had been with Isaac all this time, giving him water every place he dug a well. They couldn’t stop God’s blessing on Isaac’s life as hard as they tried. This indeed was a strange turn of events where out of nowhere the enemies of Isaac appeared and asked for his forgiveness and their relationship was permanently restored with a covenant. Isaac had dug WELLS OF OPPOSITION. Then he dug a WELL OF PROMISE. Now, he dug A WELL OF PEACE. Isaac’s opponents have recognized God’s blessing on his life so they make a treaty with him. They realized that they were not fighting Isaac; they were fighting God. So, they stopped fighting and left him in peace. And that kind of thing can happen to us, if we don’t quit, if we keep trusting God and don’t give up. E.g. The first American steamboat took 32 hours to go from New York City to Albany, New York. People laughed. The horse and buggy passed the early motorcar as if it were standing still (because it usually was). People laughed. The first electric bulb was so dim, people had to use a gas lamp to see it. They laughed. The first airplane came down 59 seconds after it left the ground. People laughed but where are those critics today? Application: Many times, people criticize our attempts to serve the Lord. Maybe they laugh or maybe they just leave. My friends, let’s not waste our time wallowing in self-pity, arguing about it or trying to prove ourselves. Instead, let’s keep on doing what we know God wants us to do and eventually God will vindicate us. For you see, there is coming a time when even our enemies will come to recognize God’s UNMISTAKABLE PRESENCE in our lives. And who knows? Some of them might even join us someday or even to make peace with us. Isaac exemplifies a right attitude towards our enemies. But there is one greater Isaac – Jesus. Our Jesus has the same attitude like Isaac – GENTLENESS. Jesus taught us to love our enemies. People were drawn to Jesus because of his love for sinners just as they were. His example included forgiveness, healing, honesty and courage. Isaac’s attitude towards enemies and opposers foreshadows our Lord Jesus’. Throughout his three and half years of ministry, Jesus faced opposition from the Pharisees and the Sadducees. Yet it was he who taught his disciples in Matthew 10:23- “When you are persecuted in one place, flee to another. Truly I tell you, you will not finish going through the towns of Israel before the Son of Man comes.” Jesus never advocated to his disciples a frontal confrontation with opposition or persecution. If that town persecuted you, go to another town to dig another well for the gospel. This non-confrontative attitude was so consistent in Jesus’ life even up to his death on the cross. ‘He was oppressed and afflicted, yet he did not open his mouth; he was led like a lamb to the slaughter, and as a sheep before its shearers is silent, so he did not open his mouth” (Isaiah 53:7). Our greater Isaac had to die “without a thought for his own welfare, beaten bloody for the sins of my people. They buried him with the wicked, threw him in a grave with a rich man, even though he’d never hurt a soul or said one word that wasn’t true. Still, it’s what God had in mind all along, to crush him with pain. The plan was that he give himself as an offering for sin so that he’d see life come from it – life, life and more life. And God’s plan will deeply prosper through him (v19-10- Message). What is this life, life and more life coming out from Jesus? It means Jesus became the ULTIMATE WELL OF SALVATION AND RESTORATION for all us after he had dug the well of jealousy, contention and accusation. By his death at the cross, the cross opens up another well – there is always ROOM ENOUGH for one more sinner. When finally he was resurrected, he became the well where you and I could draw restoration and PERFECT BLESSING from. “Let anyone who is thirsty come to me an drink” (John 7:37). When trouble comes, just remember the promises of God and persevere. Keep on doing what you know what God wants you to do until the PRESENCE OF GOD becomes so evident in your life that even your enemies recognize it. Or to put it simply: When somebody throws dirt in your well, just trust God and dig another well. As I studied on the well-digging journey of Isaac, I realized that the journey of Etab resonated so well with that of Isaac. Our church had dug well of jealousy and opposition (Esek and Sitnah) from 2012-2015. 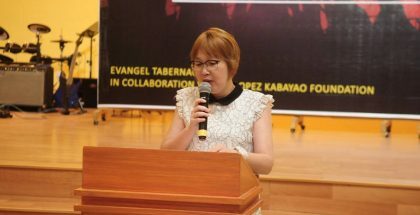 In the midst of opposition by people against the calling of Etab and us as missionaries – we kept digging and digging the well of God. 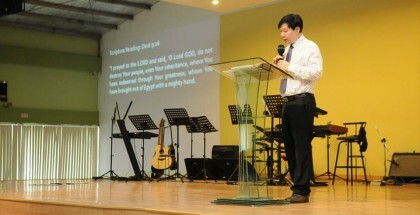 Pastor Toh Nee and me kept the calling of God. We took ownership of the inheritance which God gave to both of us. We never allowed any well-stoppers to stop us from fulfilling the ministries that God has given to both of us. We kept digging and digging. And we thank God that after 6 years of continual “digging of the well of God”, God gave us respite from evil days. Rehoboth came to us in year 2016. Yes! Restoration came to us in year 2016. Now is 2018 and our church is experiencing the well of Shebah – the perfect blessing from God. As a pastor, I dare to testify that I am seeing the perfect blessings flowing to us and our church since 2017 and those blessings caused us to stand in awe of our faithful Yahweh – who in the end of our 5th year trial, caused water to well up in the well of promises. 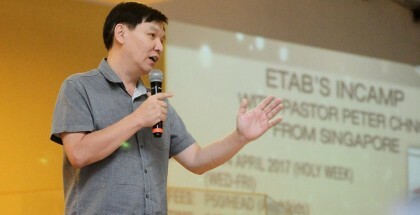 God fulfilled all the promises He gave for Etab. Glory be to God. It will be the Lord, the lawgiver of this Church, who will direct the princes and point out to the nobles of Etab- the pastors and the leaders of this church where to dig in the word of God for the well of his grace. 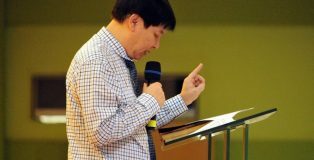 The lawgiver of this Church could also refer to the Senior Pastors – the governors of the church, the ministers of Christ. The Lord will direct Ptr Toh Nee and me to lead the congregation to this place called BEEER which means WELLS. God will give both of us the know- how to open up the scriptures with our staves [a rod] – a symbol of the spiritual authority which God gave to us as pastors of this church- so that we can draw all the blessings from the well of God’s living word and salvation. But for this well to spring up at the direction of God through the senior pastors, the princes and nobles must join in the forces by digging into the well of God’s word which God has pointed to us. Leaders of this church must also exert effort in this well-digging. For God promises that the water will spring up from these wells that we will all be digging. Consequently, our people will be refreshed and quenched in their thirst due to this divine provision. Then our whole congregation will all come together and sing praises to him. This divine provision of God, will lead us from our wilderness (2012-2015) to Mattanah – meaning GIFT [gifts and blessings of grace]. And from Mattanah, God will lead us to Nahaliel meaning “the wadi of God; the brook of God; the strength of the Almighty” and from Nahaliel to Bamoth meaning “high places or “height” [promotion and elevation]. This is the prophetic word to my leaders and pastors. So, leaders of Etab – KEEP DIGGING. KEEP ON WITH THE CALL OF GOD IN YOUR LIFE DESPITE THE OPPOSITION OR TROUBLE. Enlargement and promotion will ultimately come upon us as a result of the spring of blessing that will well up at the effort of each leader. But all the leaders must buy in the leadership and vision of the senior pastors.